Welcome to Patch 3.28! It’s Back to School in Brawlhalla, and we are celebrating the new school year with new Skins and a Color Scheme. Dress your Legends up in their Home Team Colors, sporting red, black and gold colors! The Forbidden Chest has arrived and can be found in Mallhalla with three new exclusive Skins. Additionally, we’ve changed this week’s BotW to “3v3 Skirmish!” – queue solo or as a team for some 3v3 brawlin’ action! We also have done improvements to animation, Twitch linking, bug fixes, and controller improvements. Lastly, this Season ends September 12th! Home Team Colors – Show off your school pride with these black, red, and gold colors. Back to School bonus +250 Gold per login! Please remember that protecting your lunch money is up to you and your clan. Check out the Back to School Event! The Forbidden Chest arises with exclusive Skins for Bödvar, Brynn, and Cross. Brawl of the Week – 3v3 Skirmish! Queue solo or as a team for some 3v3 brawlin’ action! No team damage, no ladder anxiety, just relax and enjoy Brawlhalla in teams. First team to KO each opponent 3 times wins! Queue alone or with friends! Updated Cassidy’s Signature animations to have facial expression variety. Removed the angry expression from Axe’s platform animations to showcase the character’s personalities better and to highlight the expression. Optimized the swoosh for Axe’s neutral light to fix performance issues. On the Unarmed’s animations, removed some cases where Skins with animated headpieces would play their falling animation, while the character could travel upward. Fixed a pop that would happen during the “Don’t Leave Me Hangin’” Taunt animation on the mammoth Sidekicks’ arms. PC players using Nintendo controllers with a diamond face (i.e., not GameCube controllers) will now see the Switch Pro Controller icon in the customize controls screen and Switch Pro Controller icons in the UI. When showing keyboard hotkeys in the UI, prompts will now show the secondary keybind if the primary key is unbound. If a player’s controller or keyboard (on Steam with the “-multikeyboard” launch option or on PS4) disconnects while playing an offline game mode, the game will now automatically pause. (PC Only) Twitch account linking UI now visually supports a proper disconnected state. Fixed a bug where the “GG” and “Inspect” buttons wouldn’t show up after an online game, if you had played an offline game previously in the same session. Fixed a rare crash on PS4 that could occur when a player used a keyboard without also having a controller bound to that same user. Fixed a bug where the PS4 store would run out of textures when doing heavy browsing. 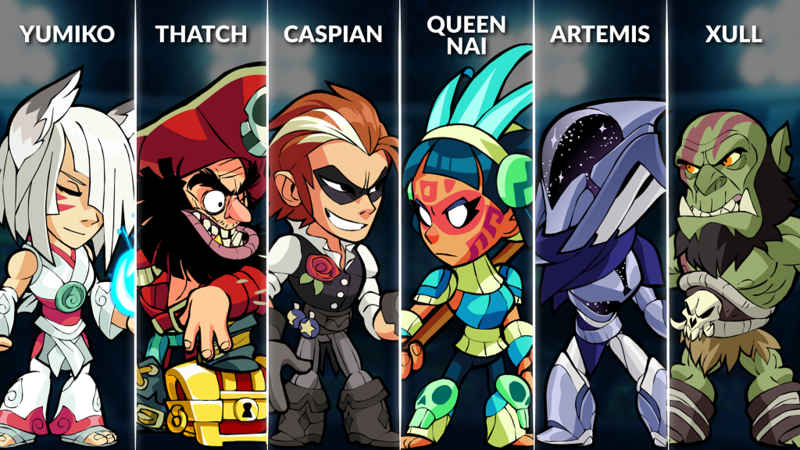 This week’s Legend rotation is: Yumiko, Thatch, Caspian, Artemis, Xull, and Queen Nai.